Ever since Toonami, that tidal wave of cartoons, Cartoon Network's actiontoon show run by Ghost Industries vec TOM, shut down permanently after 1.1 decades, and the plug pulled on the Power Rangers, eliminating future series, after 1.7, things haven't been the same at ComCent. Plus, I haven't been lately myself. So are my men, women, aliens and machines. An uncertain tomorrow, this is. "Hopefully we've left you some good memories." he said. That is right - the memories of the glory days. But they've also left us with unanswered questions too; "Where is the Absolution?" and "What happened to TOM?" to name two of them. But some unanswered mysteries are best left be. Next to join the High Heavens are - you guessed it - the Mighty Morphin' Power Rangers themselves, based on the nihonji Super Sentai Series that is, thank the Lord, still running - 34 series, 34 years and counting. in every series to date, the fight between good and evil is illustrated, with the good side winning most of the time. The basic premise of the series is that a group of five (in some cases fewer) people gain special powers (magical or technological), wear colored outfits, and use advanced weapons and martial arts skills to battle powerful beings from other planets and/or dimensions threatening to take over the Earth. In most of the episodes, after the team has beaten an army of evil creatures ("grunts") and the "monster of the week", they call for huge robotic vehicles/animals ("mechas") that can combine to form one giant robot to fight an enlarged version of the monster. 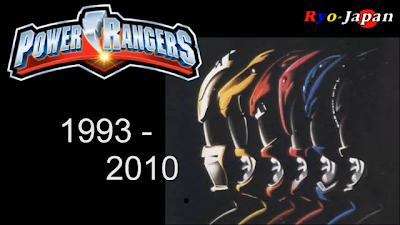 RPM, Series 16 based on Engine Sentai Go-onger, was the last Power Rangers series, and by 2010, Fox said "lights out" to our spandex-clad superhuman warriors. Only rerun TV series and still in-print toys can - and will - remind anyone of their past glory - the first toku show of all, including me... after all, someone has to start of somewhere, right? Oh well - at least they left us like every finished monster do: with a bang - a real, real big bang of glory. For some, especially some certain girls, in their grieving phases, take these facts a little... too well, and wound up sharing their fate, some honorably rendered final salutes to the heroes of old, others forgot what is behind and moved on to what is ahead, for they'll be having the latest 'n greatest stuff if they simply move on with their whole lives. Me? While the aftereffects of ending shows and playing alternate reality games (ARG) will haunt my nightmares like how demons haunt a lost soul, I was among the saluters giving a big-hearted, spirited sendoff of a goodbye, like a real trooper would do on the funerals of fallen fighters. Here's to an eternal good night to our favorites. Stay gold 'till we meet again, TOMmy-bot. May the Morphing Grid accept the memory of the Power Rangers with open arms. Bejegyezte: CaptainLévai dátum: 2/26/2010 05:44:00 de.